Category Archives: On our New House! 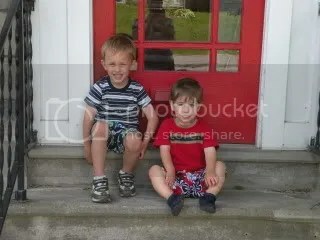 Posted by Jennifer in On Maine Life, On our New House! I don’t think there is any doubt we’ll have a white Christmas this year. It’s snowing again as I type…but it’s gorgeous outside! I made some pumpkin gingerbread a few hours ago and walked some over to mom and dad’s house; the snow was gently falling and it wasn’t very cold at all. There were quite a few people out walking, as a matter of fact. 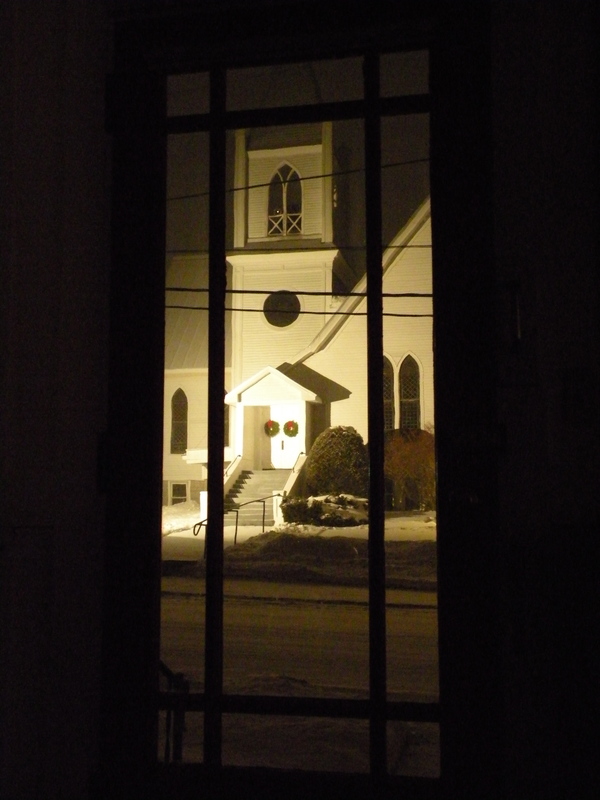 When I came back, I took this picture from our porch; minus the power lines, isn’t it peaceful? You can’t see the snow, but it’s there, alright. Handy thing, living across the street from church! Right now I’m bundled under a blanket on our couch. 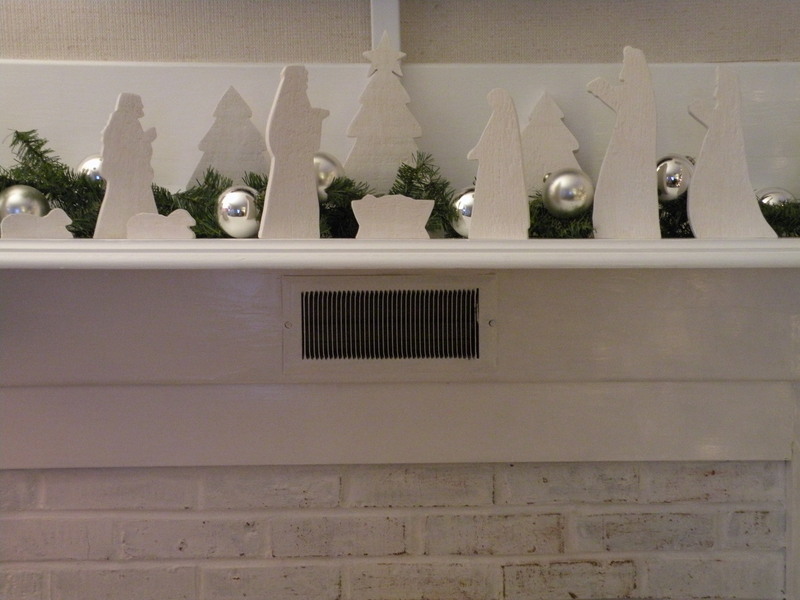 I thought I’d give you a small snapshot of this place-no big before and afters, yet, but I’ve painted the mantel and brick surround on our fireplace and put the tree up. The photo is just a glimpse-our tv is now above the mantle, but until Erick installs our cord keeper to hide those ugly cords dangling away, no full-size view! It’s hard enough for me to look at! Have a wonderful week! And don’t forget about the upcoming fun happening here, and the difference you can help make by donating to Project 320! 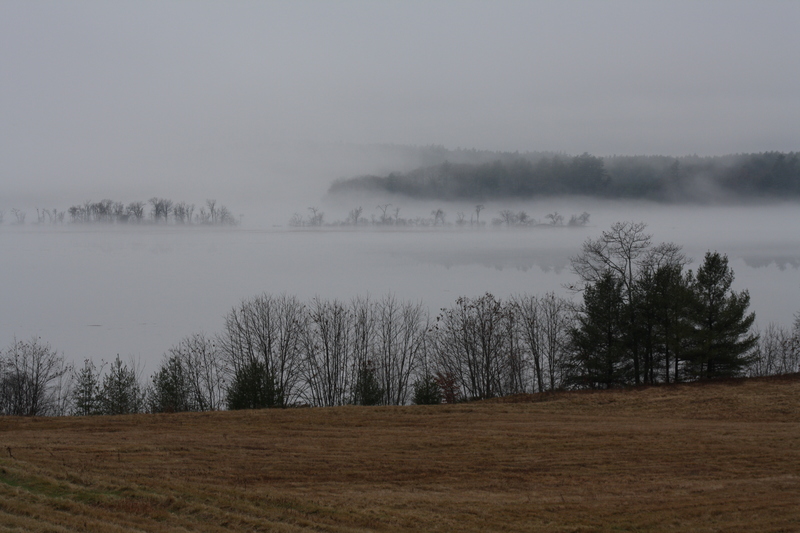 Today is a little bit like the picture above; foggy and cool. Mom and dad invited us over this morning for a breakfast of biscuits from scratch, bacon and eggs; hot coffee, a fire in the woodstove, and a James Taylor Christmas Album in the stereo. What a start to the day! Yesterday was stunning; the weather was beautiful so mom and I took off to Portland. It was a no-jacket kind of day, especially on the waterfront. Sunny and warm! Stores were keeping their doors open to let the sunshine in. And…I shopped! It’s rare that I shop, especially since Erick teaches and I’m a stay at home mom. We are pretty frugal around this place and are VERY anti-debt, thus no credit card purchases…we like to save up and wait awhile for what we want. However, I’ve been saving money aside from income tax refunds for a good long while, and I was able to not only order a loveseat for our living room, but a very nice rug, also. Eek! 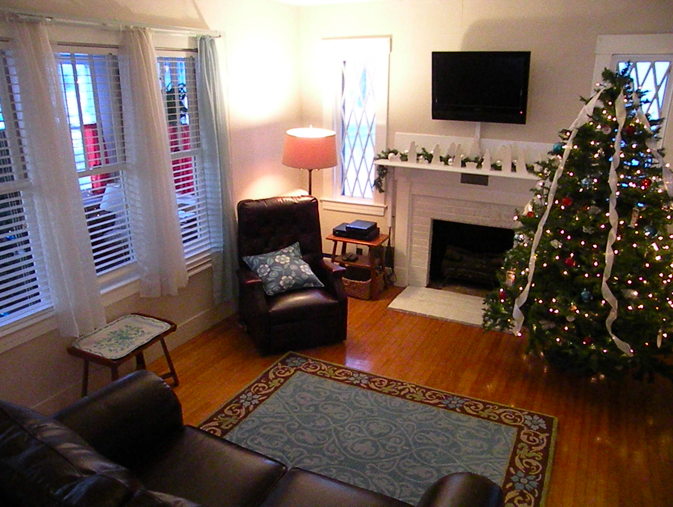 We’ll pick up the loveseat next week, the day before Thanksgiving. This weekend I’ll be painting the trim in the living room, so hopefully once everything is put together I’ll have some before and after pictures for you. Well, after to an extent. I still need a couple of chairs to complete my ultimate “plan”, but that might be awhile from now! But I think what we have right now will make a big difference. It’ll be so nice to begin putting our own stamp on this place! They are so sparkly! I think I’ll string them on a garland for our mantle, and maybe use them as ornaments for our tree. 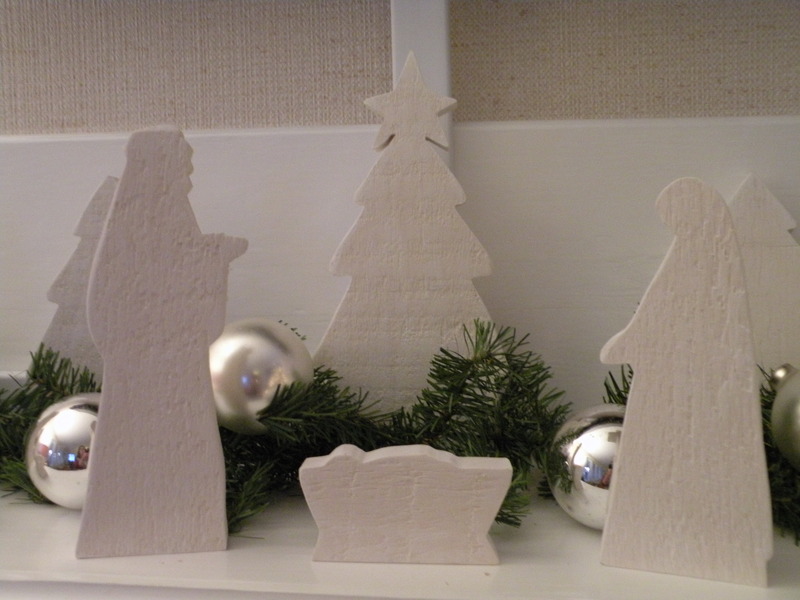 With some other ornaments I uncovered this year, I’m definitely feeling a vintage Christmas theme! Well, that makes 2 posts this week, haha! I’m getting back in the groove! Have a great weekend everyone! Posted by Jennifer in On Design, On our New House! Here are the “Befores”…someday we’ll get to the afters. *Someday*. 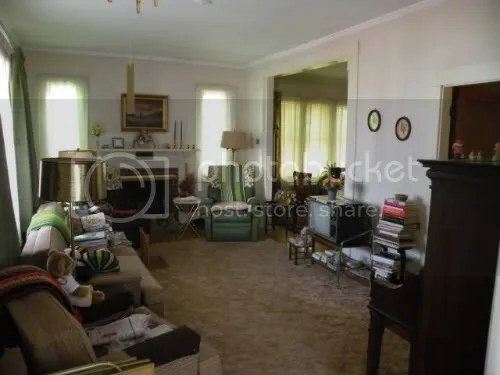 Right now I’m content enough to live within the 1970’s decor; Ms. M moved in in 1976, immediately decorated, and never changed a thing. 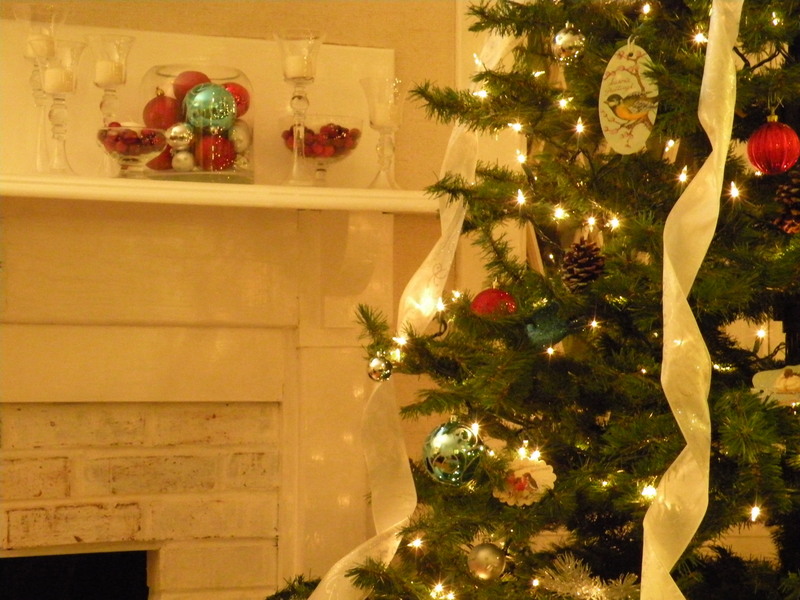 Pictures from that move-in year are exactly the same as what the house is now; she was *huge* on seasonal decorating; we are even talking St. Patrick’s Day, but other than the trinkets she would set up for the seasons, not a darn thing ever changed. Oh, to be so completely content with your decor, for so long to boot! While I’m not so hip to the 1970’s style, the fact that I am living in a decorated house, instead of a construction zone, makes my heart glad enough to let things be for the time. But boy, do I have plans! I love this “find”…it was drawn by the daughter of the owners who had the house before Ms. M and her hubby. Isn’t that a great drawing? It’s framed, so I’ll find a place for it somewhere. The tree is no longer there, and the bushes and shrubbery are also gone. (However, we do have other bushes to whack down before the snow flies.) My “plan” is to eventually have a colorful cottage garden in front of the porch and on the side of the house. 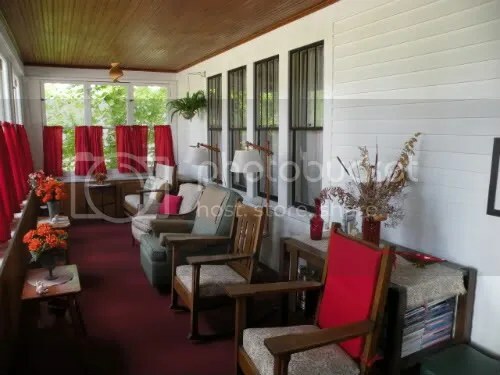 Here is a larger picture of the inside of the porch. I’m envisioning a porch swing, a day bed of some sort, and a table for evening meals. The porch seems a bit “squeezed” in this picture-it’s quite a bit wider than it appears here. I’m torn about the red curtains. 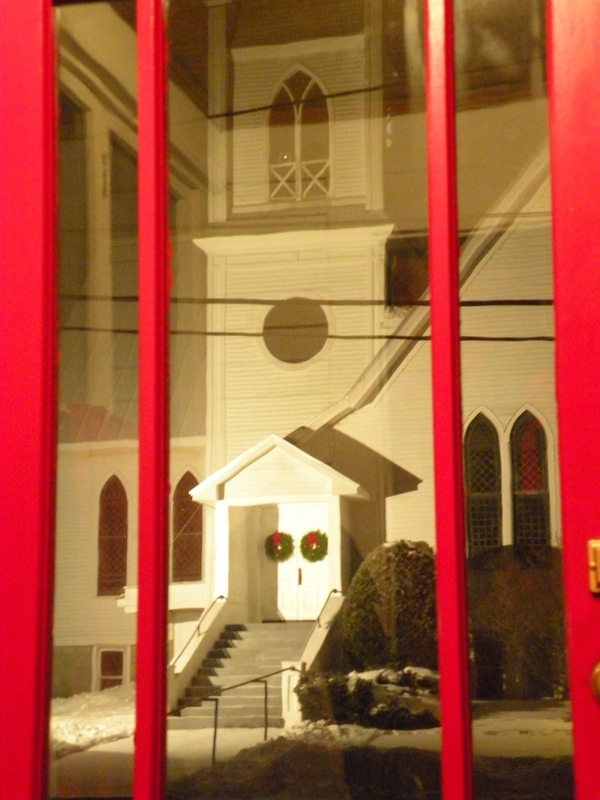 I actually do love them; there is a red door, too…but when you are inside the porch, it’s actually difficult to see outside. And I want to watch the world go by! So I might exchange them for sheers at some point, if the community doesn’t suffer from shock. Red curtains up since ’76…to take those down might be the talk of the town! 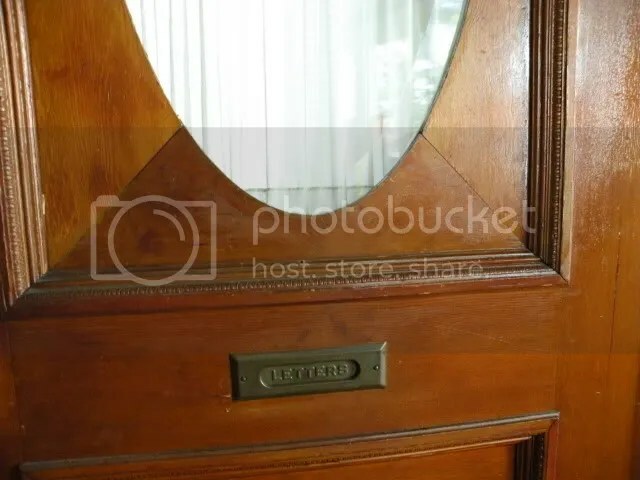 Isn’t that letter slot fantastic? That’s a pretty cluttered picture, taken before we moved in. My dilemma now is trying to figure out a good way to set the living room up. 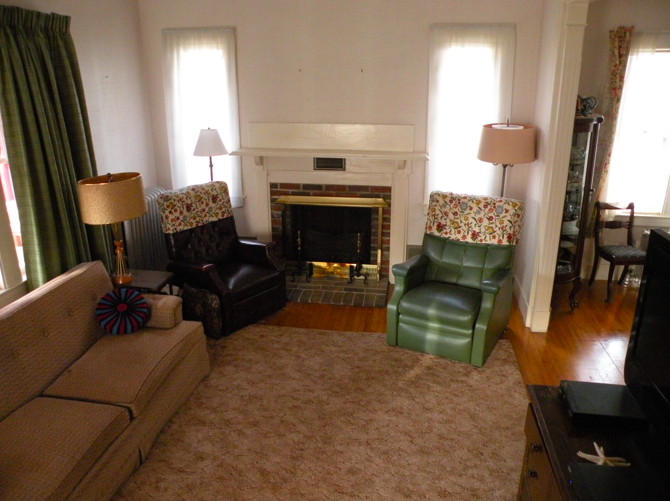 I want the fireplace to be front and center…I’m not quite sure how to do it all. I figure living here for awhile I’ll find out what the right thing will be. I’m going to redo that lamp. I think it’s great. I also love the pillows! Ms. M’s mom made them; they were big in the 1950’s. The colors make me happy…and the boys get a kick out of tossing them around and rolling them across the floor. They are pretty indestructible for being 60 years old! 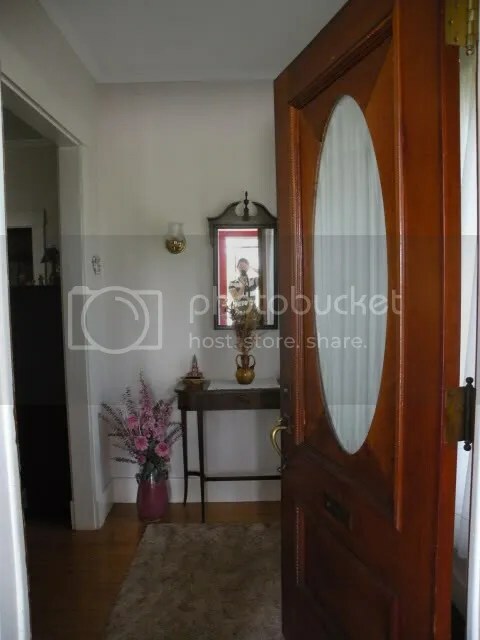 I’ll get to some other house pictures in another post; right now I’ll leave you with one of my all-time favorite finds. I adore old fans. ADORE them! When I uncovered this in the basement, I almost fell down in shock. It doesn’t work, which is GOOD, because I could see a child losing a hand in it in no time at all! But it will absolutely become a part of my decor. I think it’s such beautiful art…I love all things retro. If you like fans, too…you’ll have to check out what my friend Laura came across at a yard sale. Be still my heart! Well, time to get some work done. Mom invited us over this morning for some raspberry pecan muffins…as long as I could bring an egg to round out the ingredients. I tell you what-this is so convenient. But I’m absolutely positive that passers-by must think I’m a looney toon. At other times you’ll have seen me walking down the street with a pizza, fresh from the oven, in the pouring rain; once a package of bacon. Sometimes a bag of laundry (our dryer is busted), once a bottle of ketchup and mustard. LOL. Anyway, after those muffins mom volunteered to watch the boys so I could get a blog in and some housework done. I’m lovin’ it! I’m hooked. This is really ridiculous. I let my children eat them before breakfast, just so I could have some too. Ack. I’m such a good mother! Good news is, we just shared two packages, making that 2 Little Bites a piece. Now I do believe they are all gone, and I’m going to have to practice some serious self control not to make a mad dash to Shop n Save to purchase more. We’ll see how long that lasts. Erick’s last day of summer school is today, so tomorrow we are finally going to treat the boys to a well deserved vacation. We are taking them to see Thomas the Train near Boothbay at the Railway Village, then we are camping out at Hermit Island, fitting in some time at Popham Beach. I’m so thrilled. Monday, E and I will head out for a couple of nights, and we plan to spend a day in Boston. It’s a pre-10 year anniversary trip; our anny is in October, but it’s hard to find the time for a vacation during the school year. Anyone have any suggestions for must-see’s around Beantown? Even though we are only about 3 hours away, I haven’t been there since vacation when we lived in New Mexico. That was eons ago! And here is a little sneak peak of the New House. Be still, my heart…I’m so happy I could burst. I finally feel “at home”, as much as I can before I reach my true Home. I can’t wait to share “afters”. I can’t wait to put my own spin on the place. I’ll follow up with a few more pics and stories in the next post! red front door! i love red front doors! and...i finally have a porch. blessing upon blessings.